Excellent for guitar amps - quick and easy to use while delivering a beautifully balanced sound. Delivers excellent guitar amp sound. Easy to use. Rugged build. Sontronics' existing Phantom-powered ribbon mics - the Sigma and Apollo - have cemented the company's deserved reputation for well-designed and reliable mics that combine a traditional ribbon sound with the beneﬁts of active electronics. So it should come as no surprise that its latest offering, the Delta, follows suit and looks set to build on this heritage. Shorter and fatter than the Sigma, the Delta is designed to be more rugged and up to regular use in a live environment. Reading Sontronics' press release it's clear they have that ribbon favourite guitar ampliﬁers ﬁrmly in their sight. But to be fair, any instrument with complex high frequency content (drum kits and brass spring to mind) can beneﬁt from the smoothness of a ribbon mic. So, aside from the size and shape, what else marks the Delta out from its sibling? Basic specs such as ﬁgure-8 pattern and noise ﬁgures (14dB) are similar, and you get the same type of suspension cradle. Mics are individually serial-numbered, although for the Delta this is a sticker on the underside, rather than an etched faceplate like the Sigma, which is a shame. At £499, its price is also similar to that of the Sigma. But beyond these points, the Delta is deﬁnitely a different beast with slightly lower sensitivity (11mV/Pa) and a quite different frequency plot. Clearly, our ﬁrst test had to be an electric guitar amp. With the Delta in close at a few inches and centred on the speaker cone, the sound is brilliantly rounded and balanced with plenty of proximity and none of the pokiness you tend to get from dynamic mics. Obviously, the higher top end is restrained, and this may not be ideal for all applications. What's more, although the plot indicates a slight mid-range lift at 2kHz, this isn't obvious to us. However, in typical ribbon mic style, you can add plenty of top end EQ without things sounding too processed. Although ribbon mics have theoretical ﬁgure-8 patterns, the front and back do tend to sound slightly different. Sticking with the guitar amp and ﬂipping the Delta round produced a slightly brighter sound, although the differences were subtle. 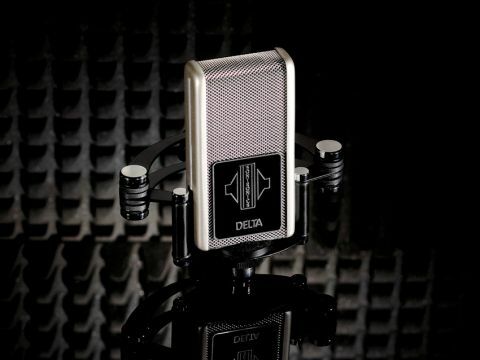 Moving on to some other sounds, the Delta easily delivers a warm, radio-friendly speech tone. It also does a good job of rounding off the edges for hand-held percussion such as shakers and tambourines. Peering through the mic grille, it's obvious there's an extra layer of protection compared with the Sigma, and the ribbon assembly (or motor as it's known) is not visible. This may have been done to add wind protection or modify the frequency response… either way, with any plosive or air-shifting source, speech and vocals especially, the Delta still beneﬁts from a standard pop shield. Clearly, the Sontronics Delta sets out to deliver silky smooth electric guitar sounds with a retro ﬂavour, and in that respect it really delivers. What we didn't expect was how easy it would be to achieve this. Positioning on a guitar amp is quick and simple, making it an instantly rewarding mic. And if you want some extra top end, it responds well to EQ. Even so, like all ribbon mics it's not what you'd consider an all-rounder, so it should be purchased to complement the condensers and dynamics in your mic collection rather than replace them.